Placing beam reinforcement is easy if you have some basic idea about the steps of placing beam reinforcement. 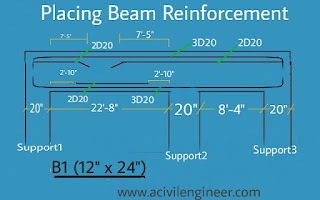 In this post I’ll give you an idea for placing beam reinforcement in 5 easy steps. Study the general notes sheet of structural drawing carefully. Collect the following data from general notes about beam reinforcement. Lap length: Beam has mainly two types of longitudinal reinforcing bar. One is top longitudinal bar and another is bottom longitudinal bar. When the length of a longitudinal bar is more than the full length of reinforcing bar then another reinforcing bar is provided by overlapping with existing one. The length of overlapping is called lap length. The lap length for different diameter bar is shown in the general notes sheet of structural drawing. The lap length can be differed for top and bottom longitudinal bar of beam. Collect lap length details for different diameter of top and bottom longitudinal bar of the beam. Bend Length: As we know, all longitudinal bars of beam should be bend at the end of the bar. The length of bend is suggested by structural engineer in the general note sheet of structural drawing. Check if there is any instruction found in the general note sheet about the bend length. If not found follow a general formula for 90° bend suggested by ACI code. That is 12db. Where “db” is the diameter of bar. Clear Cover for Reinforcement: Find out if there is any instruction for the clear cover for beam reinforcement in the general note sheet or beam layout sheet or in the beam reinforcement detailing sheet of structural drawing. If not found you can follow the instruction shown in the following post. Okay. We’ve collected required data for placing beam reinforcement. Now move on to next step that is calculating the cutting bar length. For Calculating cutting length of bar you’ll need a beam reinforcement detailing sheet of structural drawing. From the drawing you’ll find the size and number of bar to be placed in a beam. Suppose you’ll place the reinforcement for a beam (B1). Now look for B1 in the beam reinforcement detailing sheet. B1 will look like the image below in the beam reinforcement detailing sheet. If you don’t understand terms of beam reinforcement such as top bar, bottom bar, etc. then read the following post. Now let’s start calculating the cutting length of different bar. For getting cutting bar length follow the following rules. = Length of beam – 2 x clear cover + 2 x bend length + lap length. Let’s calculate from the example image above. Bend length is 12db for one bend which we found in step-1. As we know the full length of a reinforcement bar is about 40′ and the length of top longitudinal bar of our example beam doesn’t exceed that length so you don’t have to provide lap for top longitudinal bar. The length of bottom longitudinal bar is same as the top longitudinal bar. That is 37′-4″. In the example drawing (above image), extra top bar is shown in two places. One is on support1 and another is on support2. See support2 and support3 hold the same extra top bar. = extended bar length from support1 + width of support1 + bend length – clear cover. = distance between support1 and support2 – 2 x distance between support and extra bottom bar. Stirrup: Calculate the cutting length of bar for the stirrup of the beam and make required number of stirrups before star placing reinforcement of beam. Read the following post to know more about how to make stirrup. All of these bars are 20 mmø. So slice 20 mmø bars as required length and number. Make 90° bend at both end of top longitudinal and bottom longitudinal bar. Make bend at one end of extra top bars. Make required number of stirrups. If all the bars are ready then you can start placing them. You can’t directly place the bars into the form of beam. For placing bars you have to make stand on the supports (column) to hold beam’s reinforcement. Hang the top longitudinal bars on the stand. Hang stirrups on top longitudinal bars and bind them with top longitudinal bars by binding wire. Now insert the bottom longitudinal bars into stirrups and bind them also with stirrups. Then place extra bottom bars on the bottom longitudinal bar. Don’t forget to put spacer between bottom longitudinal bar and extra bottom bar. Following same rule bind the extra top bar. If everything is perfect then place them into the form of beam. Here one thing I want to explain that you can’t place reinforcement of single beam into the form. You have to finish binding reinforcement for all beams of a floor and place them simultaneously into the form. We call this dropping beam. Before dropping beam don’t forget to put cover block below reinforcement. I think you noticed one thing that I didn’t deduct the extended length for bend from the cutting length of bar. Because it doesn’t have any major effect in our example beam. However, I’ll discuss about that in some other day here in this blog. So please subscribe to email newsletter to get that to your inbox when it happens. 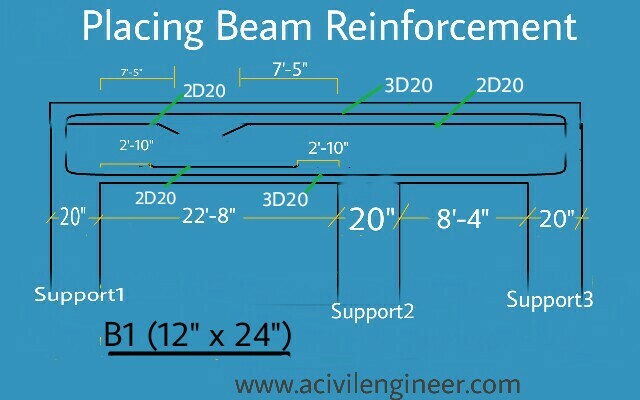 Do you have any better idea for placing beam reinforcement? And also how do you calculate the extended length for bend of bar? Please share in comment below.